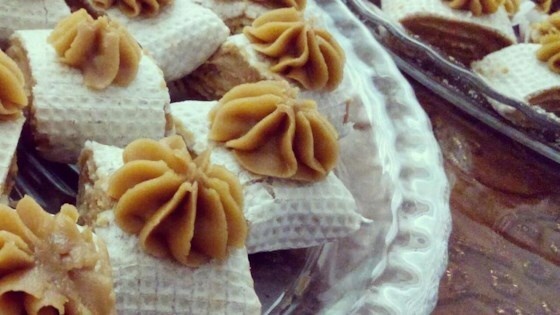 "Halva is a favorite dessert throughout the Middle East. Many varieties are made with tahini or semolina flour. This Persian version uses a simple mixture of flour, butter, and sugar with the sweet perfume of rosewater. Cut into wedges and serve with tea or coffee." Bring sugar and water to a boil in a saucepan; cook, stirring constantly, until sugar is dissolved, about 5 minutes. Stir rose water and saffron into the sugar mixture; cover saucepan and remove from heat. Melt butter in a large saucepan over low heat; stir flour into the melted butter until mixture is a smooth paste. Continue to cook, stirring often, until paste turns golden, about 5 to 10 more minutes. Slowly whisk sugar mixture into paste until smooth. Remove saucepan from heat and spread halva evenly onto a plate or platter. Make a pattern on the top of halva using the back of a spoon or a knife. Cover with plastic wrap and refrigerate until set, at least 1 hour. Substitute 1 cup of flavorless vegetable oil for the butter to make a cholesterol-free sweet. Decorate the top of the halva with whole pistachios or almonds or simply sprinkle with chopped nuts. Rosewater is available at most Middle-Eastern stores and at many health food stores. I substituted white sugar with brown sugar and it turned out perfectly! I made this for my Persian husband and we both loved it! It's a lot lighter than other halva's I have eaten!